A biome is a particular kind of large ecosystem, or environment of living things. Biomes are described primarily on the basis of their weather, animals and plants. Earth includes about five aquatic (water) biomes and five land (terrestrial) biomes. The deciduous forest biome, also called the temperate forest biome, is familiar to most kids who live in northern North America, most of Europe and the Far East. Deciduous forest facts can be loosely grouped into information about this biome's locations around the globe, its climate and weather, its flora (or vegetation) and its fauna (or animal life). 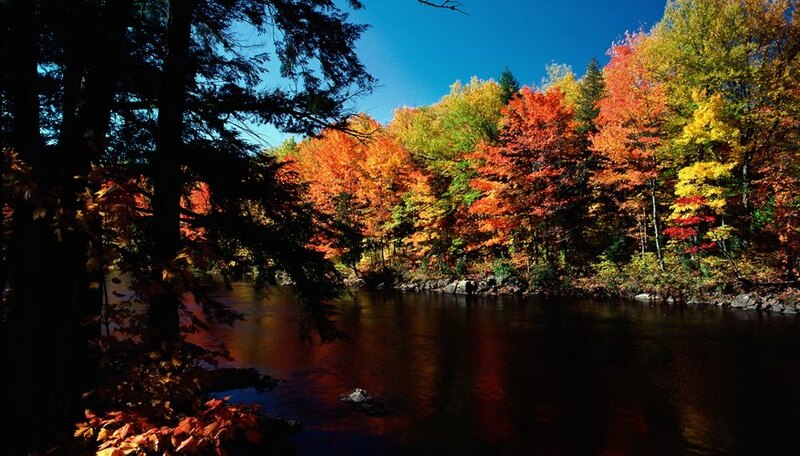 Deciduous forests are found in the eastern United States, Canada, Europe, China and Japan. Kinds can be shown on a globe or large map that all of these places are about halfway between the equator and the North Pole. Kids should recognize that there is nothing special about the Northern Hemisphere that allows this; it is merely the lack of land mass south of the equator at the right latitudes that leads to the lack of deciduous forests in this half of Earth. These forests are also divided into vertical zones, with 100 feet being the ceiling (near the tops of tall trees) and the ground being the floor. "Temperate" means mild, and the temperature range for this biome is roughly -30 degrees Celsius to 30 degrees Celsius (about -22F to 86F) with a worldwide average of 10C (50F). This means that temperatures rarely, if ever, get either extremely hot or extremely cold, although winters are more severe at the cooler end than summers are at the warmer end. Again with an eye on the globe, kids can learn why to expect mild temperatures in this biome. This biome experiences all four seasons (winter, spring, summer and autumn) and a large amount of rainfall (about 30 to 60 inches per year). Some basic facts about decidous trees and plants for kids is that they include broadleaf trees (oaks, maples and beeches), shrubs, herbs and mosses. Kids can be invited to explain, for example, the Canadian flag on the basis of one of Canada's largest biomes. "Deciduous" means "shedding," and kids might be taught that "baby teeth" are actually called deciduous teeth by dentists because the body sheds them. It is these trees that are responsible for the beauty fall foliage, because in the autumn, these broad leaves do not get adequate sunlight and begin to die, causing the green chlorophyll to decay into red, yellow and orange. Beck, Kevin. "Deciduous Forest Biome Facts for Kids." Sciencing, https://sciencing.com/deciduous-forest-biome-kids-10046268.html. 06 August 2018.